I can't. These words combined is the most dangerous phrase a person can say. I have thought this about myself many times throughout my life. I have let these harmful words creep into my mind and limit my own abilities. Each and everyone of us is capable of doing so much within our own limitations. I mention of limitations because we are human. It is not possible to jump over the moon so to speak. But we can receive the training and become an astronaut to fly to the moon. I know after reading the last sentence that many people will say, "I can't become an astronaut." If you think you cannot then of course you will not. I am just using the scenario of flying to the moon as an extreme example. The same goes for anything we want to do in life. Many people will make up excuses for not being able to do something. Some people may think they have physical disabilities that would hold them back from doing things they want to. In some cases this may be true. But in many cases it really is our own minds holding us back. Jennifer Bricker is a perfect example of how a person can reach beyond the limits that others saw in her. Jennifer was born without legs. This did not stop this incredible young lady. She was adopted by a family who told her she can do anything she set her mind to do. Jennifer wanted to do gymnastics. She worked hard and accomplished her desires. People with the "I can't" attitude would tell her that it is not possible for a person without legs to be a gymnast. Jennifer did not let that stop her. We limit ourselves. Our minds are powerful. Success or failure is within our own minds. If a person thinks he or she can do something and puts in the efforts to accomplish this task, the chances of success will be high. This does not mean that there will not be failure along the way. Micheal Jordan did not make every shot he attempted. The best quarterbacks in history did not complete every pass that they threw. The best singers in the world will hit an off note. The difference between success and failure is attitude. The first step is believing in yourself. The second step is making yourself do the work. The third step is believing in yourself again when the disappointing moments happen. The forth step is getting back up and moving forward after those disappointing moments. It is all a cycle. We can choose to end the cycle at any time. We end it when we let a disappointing moment stop our progress and say, "I can't." Surround yourself with good people and be a good person back. If you are positive other people will want to be around you. There is always someone nearby who will tell you that you cannot do something. It is usually a person who has the "I can't" mindset about their own dreams. Since this person tells him or herself that he or she cannot they tend to drag others down to their own level. People who are successful will not tolerate this type of negative feedback in their lives. Give positive feedback to those around you. If you put forth an attitude of encouragement to others you will most likely receive positive feedback as well. There may always be the negative person around to drag you down. But do not listen to them. Often times the people trying to drag you down have no idea they are dong so, they simply think they are trying to help. They believe they are keeping you from disappointment. These people may even be close family members such as a parent or a spouse. Those are the most difficult people to not listen to. However, you must continue to listen to yourself and continue to work towards what ever your dream may be. Well, there may be some dreams that should not be worked towards. Dreams that are illegal or immoral are not really dreams, but just bad ideas. Find good examples to follow. See what these people did to become successful. You will find that anyone who has great success has had a path riddled with moments of failure. But they did not give up. Never again say, "I can't." Say, "I can." If someone tells you that you can't, simply prove them wrong. What Ever Happened to Good Old Fashioned Manners? There has been a great deal in the news lately about flights that have diverted and made unscheduled landings due to unruly passengers. Some of these events have been due to disputes between passengers over seats being reclined. In one incident a man used a device called the Knee Defender. This person used the Knee Defender to keep the woman in front of him from reclining her seat during a flight. A flight attendant asked him to remove the device. When he refused the woman in front of him through water on him. There are faults on both sides of this issue. First, if anyone ever listens to the briefings that are given at the beginning of every flight, they would know that it is a federal regulation to comply with all lighted signs and crew member instructions. In other words, when the seat belt sign is on passengers are required by law to remain in their seats. Additionally, when a flight attendant tells you to do something the law requires that you follow those instructions. Therefore, when this man did not remove the Knee Defender he was in violation of the law. On the flip side of finding fault here lets look at the woman who through the water on this man. There is only one thing I can say about this. REALLY??? Some people think they can do what ever they want. Should she be able to recline her seat? There could be a heated debate on both sides of the isle regarding that topic. I personally do not recline my seat when I am a passenger in the cabin of an airplane. That simply is my choice. I know how it can be an inconvenience when someone in front of me reclines his or her seat. I do not like it, but I also do not say anything to someone doing so. There is this thing called civility. Both people in this case were within their rights to politely speak to the other person about the situation and work it out in a civil manner. But when it gets to the point that the pilots decide to land the airplane and have these people removed from the aircraft then many people are inconvenienced. First, this cost the airline thousands of dollars just for the additional fuel. The flight crew is being paid by the hour so there are additional wages to be paid. There are many other things to consider than just operational costs. With the delay that is caused passengers will miss flight connections. Often times travelers have plans that may have to be canceled and may not be able to receive refunds on these cancelations. Due to missed flights the airline may have to pay for hotels and meal vouchers for passengers. When it is all said and done with the costs are enormous. There is one simple solution to a situation like this. First, make sure the people responsible are arrested and charged. Secondly, anyone who suffers financial loss due to the delay should be subject to reimbursement from the offenders who caused the delay. On one of these latest fiascos one woman involved said she did not care what the circumstances were she demanded that the airplane land. I am guessing that if she were billed for all of these additional costs she would not be so demanding in the future. Also, if word got out that people were being charged thousands of dollars that other people would not be so fast to act in such a childish manner. It all gets back to how we treat each other. Rudeness does not help in any situation. Being polite and thinking about others is just the right thing to do. However, we live in a society today that people think only of themselves. We have become so selfish many people think they can do whatever they want without suffering any consequences. It is time to return to people using good old fashioned manners. If more people thought about how their actions affect themselves and others, our society would be far better off. Often times we let obstacles stand in our way of obtaining our goals. How many times have you said to yourself that you will start a certain project when ___________ (Fill in the blank.) I know I have. Each and everyone of us has things in life that we would like to achieve. Goals and dreams are different for each person. Some people's dreams may be simple such as visiting a state other than the one they live in, which may be a short distance away. Then there are people with more elaborate dreams, like becoming a movie star. No matter what those aspirations may be it takes effort on the part of the person who has the desire to be able to achieve it. For the person who wants to visit the neighboring state, he or she must take the time to make the trip. If transportation is the issue then there must be effort put forward on finding a way to get there. This example seems very simple, but you would be surprised as to how many people have easy goals, yet no effort is put forward to achieve these things. Making excuses for not succeeding is easy. The more elaborate goals require even more work to accomplish. To become a movie star a person has to make contact with the right people. He or she needs to be able to act. Therefore, acting lessons may be in order. I am sure that someone in the entertainment industry could come up with a long list of things that would have to be done for someone to be successful in this area. Even then, there is no guarantee of success. I continue to get emails from around the world. Often times these emails are from people who are already pilots and suffer from depression. I am also contacted by people who want to become pilots, but fear they may not qualify for an FAA medical due to depression. Someone who suffers from depression can make up many excuses as to why their goals cannot be accomplished. But I know that with hard work and not giving up on your goals that much can be accomplished if a person sets out to succeed. Several months ago I received an email from a young woman who is going to college and wants to be a pilot. She was worried about passing the FAA medical exam due to depression. She was on antidepressants. She had researched the policies of the FAA and knew which medications she could take. She knew what she had to do to obtain her FAA medical certificate. It took her several months, but she was successful. SHE DID NOT GIVE UP! This young lady and I exchanged emails throughout the months as she got closer to her goal. She was able to get her medical certificate. I talked with her on July 2nd and she had her first solo flight. I could not be more excited for her if she were my own daughter. It was a wonderful feeling to have her tell me about her accomplishment. I write about this young lady to share with others that goals can be obtained. I talked with her on the phone a few times when she was not certain if she could do it and talked about giving up. We all go through times like this. Giving up is easy. Going forward takes effort. I am very lucky to be able to do something I love. In the year 2012 there were a total of 610,576 total people with FAA pilot certificates who were actively flying according the the FAA. Out of that number about 120,000 were student pilots, 218 held recreational certificates, 4,493 were sport pilots, 188,001 had a commercial pilot certificate, and 145,590 held an Airline Transport Pilot (ATP) certificate. Statically, being a pilot a rare thing. When comported to the total population of the United States only .2%, not 2%, but point 2% (just in case you thought the dot was just a spot on your computer screen) of the population of the United States has any type of pilot certificate. People who have an ATP make up only .05% of the population. Many people not in the industry become confused with the wording. A commercial pilot certificate is the rating needed to be paid to fly an aircraft for most jobs. This could be flying a banner tow airplane for hire, giving tour flights ect. A person flying for an airline must be ATP rated. This is also the same certificate needed for a person to fly as pilot in command performing charter work if flying a jet aircraft. Having a commercial certificate is not sufficient to fly for an airline. The commercial certificate requires a minimum of 190 hours to 250 hours total time depending on the type of training program the pilot attends. An ATP certificate requires at least 1,500 hours total flight time. There are other things a person must do to obtain each of these ratings on top of the hours flown. Often times I am asked if I am a private pilot or a commercial pilot. I am neither. I hold an Airline Transport Pilot certificate. Many times people will call a charter or a corporate pilot a private pilot. This is not the case. A private pilot cannot fly for hire. This wording is used mainly because the aircraft being flown in these cases is privately owned. I mention these ratings a person must earn to share with you the time and effort that goes into having a career on the flight deck of an aircraft. Earlier I said I was lucky to do what I love. I take that back. It was not luck that got me to where I am today. It was time, effort, determination and hard work. In other words. if something is really wanted, it is worth going after. Congratulations Kristin on her first solo flight. I knew you could do it. Keep up the hard work and always love what you do. As a pilot I have to have confidence in the aircraft I fly. I have to know that it is in good mechanical condition. I have to have confidence that it meets all safety and regulatory guidelines. And I have to have confidence in my abilities to operate the airplane. I have assistance in developing confidence in the condition of the aircraft. I am provided with maintainence reports that show the aircraft is airworthy and meets all guidelines to be operated safely. Having confidence in myself is not as simple as checking documents though. I have been thinking about confidence lately. I usually consider myself somewhat of a confident person. Yes, there are times I question myself and my abilities. I think every person should do that from time to time to find ways to improve our skills in anything that we may do. But what has made me think more about confidence was spurred on by a conversation with a young man who works at a McDonalds I frequent near my home. This young man would greet me as I came into this McDonalds every time he saw me. He always had a smile on his face and was friendly and fun to see. There was a time I did not see him for a while and was told by others who worked there that he had not shown up for work in over a week. I later heard he was having some difficulties in his life. I was relieved to see him back at work shortly after that. I took some time to chat with him one day. I told him that I knew he had it within him to do great things with his life. He looked at me with great surprise and asked me how I knew that. I told him that I simply could tell by talking with him and that I knew it from the first time I met him. Once again, he was surprised and said to me, "Really?" At this point it was me who was surprised. I realized that he truly did not believe in himself to do great things. It made me wonder how many people there are who have no self confidence. As I mentioned earlier, I have had times of self doubt, but I have always seemed to worked through these times and push on to accomplish what ever it was I wanted to do. I know nothing of this young man's background. I do not know if he had a good home life as a child or if his childhood was difficult. I do know that many people who were reared in abusive homes tend to lack self confidence. However, I can testify that survivors of abusive upbrinings can also go forward with life and be successful in what ever it is they choose to do. My heart went out to this young man. It made me wonder what I might be able to do to help him believe in himself. The best answer I came up with for now is simply to be a friend and let him know I believe in his abilities to build his character and become a strong positive person. I feel it is important to be good role models for other people. I have discovered that there are people who look up to me. I have never thought of myself as a person that someone else would look up to. Therefore, I would say that many people have others who look up to them and do not know it. This is the exact reason why it is important to be the best person we can be at all times. Yes, everyone is imperfect. But the harder we work to be better at whatever it is we do in life, the better we will become. If we can be a good example to someone who looks up to us then we can have a positive impact on another person's life. Going through life just to improve our own stature or financial situation for our own good is not what this life is all about. We could have a debate for years about what life is all about. But I believe that simply working to only improve our own status is simply selfish. The willingness to help others is important and in the long run will add to our own happiness. I have noticed that some of the happiest people I have known are those who are willing to help others. As we help others our own self confidence grows as well. I know it may sound as if I am rambling on at this point. But the conversation I had with this young man left an impression on me. I am still saddened by his lack of belief in himself. It makes me want to reach out to people like him. I hope that he can start to build a trust and belief in himself that will aid him with the daily challenges in his life. We should all strive to be mentors to others in this life. Even if there is not an official status of being someone's mentor we can conduct ourselves in a manner that others could learn from each of us. We all have people we look up to. But I would guess that most of us have people who look up to us as well. One of the biggest complaints I hear from travelers is about going through security. Long gone are the days when anyone can go through security. The screening of bags and people is far tighter than what it was before 9/11. Due to the world that we live in today tighter security is necessary. The people who work for the Transportation Security Agency (TSA) have a huge responsibility. Many people complain about going through security. But think of the dangers that would face travelers if precautions are not taken. The biggest downside to going through security can be the long lines. At larger airports on heavy travel days security wait times can be well over an hour. Planning ahead and being at the airport early is important to being at the gate on time. I have a sister-in-law who found this out the hard way when she missed her flight to Hawaii and had to come back the next day. There is some relief available to travelers now. TSA has a program knows as Pre Check. A traveler who is on the Pre Check program goes to a line just for them, which is much shorter than the standard lines. Additionally, in this line people are not required to remove their belts, shoes or light jackets, provided these items do not set off the metal detectors. In the standard line people are required to remove computers and liquids from their bags and put these items in a separate bin for scanning. Travelers who are Pre Check approved are not required to remove these things from their bags. Using Pre Check can greatly reduce time and hassles while going though security when traveling on the airlines. The main qualification for applying for this benefit is the applicant cannot have been convicted of certain crimes. The details can be found on TSA's website, TSA.gov. Now that you are through security you have to find your gate. Keep in mind that flights can change gates. Even though the gate number may be on your boarding pass check the boards at the airport for any changes. Personally, I use FlightTrack, an iPhone application that gives me gate information on all flights. It is normally up to date, but occasionally has some misinformation. Keep in mind when you get to the gate that if there is a change in gates that the gate agent has nothing to do with the change. I cannot begin to guess the number of times I have heard somebody being rude with a gate agent simply because there was a gate change. Gate agents have one of the most difficult jobs in the airline industry. These people take horrendous verbal abuse by frustrated passengers for events that the agents have no control over. For people who do not travel often, remember that once you have a boarding pass that you do not have to check in with the agent when you get to the gate. The way to know for sure if you have a boarding pass is that if you are through security you have a boarding pass. No one is allowed through security without a boarding pass. The boarding pass will have your seat assignment printed on it, unless you are standby or traveling on SouthWest airiness. SouthWest does not assign seats and has an open seating policy. A SouthWest boarding pass will have a boarding position on it. Another way to speed things up at the airport is to print your boarding pass at home. Simply go to the airline's website and find the link for checking in for a flight. This feature is available within 24 hours of departure of you flight. You can also avoid checking bags in at the airport and go strait through security if you take bags that are carry on size. The standard carry on bag size is no larger than 9" X 14" X 22". You are allowed to carry one two bags. If you are on a trip with connecting flights and do not wish to carry your larger carry on bag on and off airplanes you can choose to gate check your bags all the way through to your destination. The gate agents will normally make an announcement regarding this on full flights. You will not be charged a bag fee if you decide to do this. Do not confuse this with a gate check bag on regional aircraft that you pick the bag up at the gate at the end of that flight. Simply ask your gate agent if you gate check where you will pick your bag up when you gate check it. I hope this information will be helpful for people who do not travel on a regular basis. As an airline pilot I have been asked numerous times by friends, family and even passengers what my thoughts are on the missing flight. Normally, I am not one to speculate. Since I am not big on speculation I dance around the topic with people I am close to by joking and asking them if they are trying to cause my wife to divorce me. Of course the give me a strange look of confusion and ask me what on earth I am talking about. My answer is, "Anything I have to say would be pure speculation. Speculation leads to rumors. Rumors leads to lies. Lies are sinful. Sinfulness leads to divorce." Of course I can only use that line with people who know me and my oddball sense of humor. Okay, so hear goes my speculation for the record. I sure hope this does not lead to my wife leaving me. I have actually not followed the news as closely as many people have regarding this incident. All I know for sure is that a Boeing 777 departed Kuala Lumpur International Airport to Beijing Capital International Airport on March 8, 2014. Somewhere along its route, the aircraft mysteriously disappeared. Unless officials have information that is not being shared with the public, these items are literally the only facts known about this mystery. There are some other facts that we could look at though. First, each airline flight is given a distinct transponder code. Actually, any aircraft operating under instrument flight rules (IFR) is issued a transponder code. This code is used by air traffic controllers to identify each aircraft on the radar screen. A controller will know things about these airplanes such as the type of aircraft, its altitude and direction of flight. It gives the controllers the information they need for separation of traffic and allows the controllers to give the pilots instructions as needed for a variety of reasons. There are a few reasons that a radar could no longer track an aircraft's transponder. First, is if the transponder malfunctions. However, on airliners there would be a backup transponder. Both of these transponders would have the assigned "squawk" code entered. Secondly, if the transponders were shut off. The third reason is if the aircraft was not flying in a radar coverage area. In this case the missing flight was under radar coverage when it went missing. The fourth reason would be if the airplane went down. Lets take a look at the possibility that the airplane went down. The last known location was known by controllers. At least the last known location where controllers were able to see while the transponder was still operating. A search in this area would reveal any wreckage of the airplane. Even if that plane went down in a body of water there are many things that would float to the surface allowing search and rescue to find the crash site. Additionally, there is other evidence that indicates the 777 remained in the air for a few more hours after contact was lost. Some media outlets have speculated that cabin pressure may have been lost and the pilots were unconscious. This is a possibility. However, this does not explain the mystery of the transponder not working or being turned off. If the pilots did loose consciousness they could not have turned off the transponder. The airplane would have continued to fly on the course that was programed into its flight management system (FMS) on the autopilot until it ran out of fuel. This would have allowed search parties to look along the aircraft's planned route of flight. Now the media is reporting that the background of everyone on the flight is being looked into, including the pilots'. Some people are speculating that the plane was hijacked, landed somewhere and is being hidden. I have heard some wild conspiracies on this topic. I will not even begin to get in a discussion over some of the things I have heard regarding this. However, lets do look at the possibility of hiding the airplane. First, it has been several days since the aircraft went missing. When a hijacking or kidnapping occurs the group or those responsible do not take long to come out with demands. Known terrorist organizations want to flaunt their evil intentions to the world to prove they are in the right. These people are not ones to be ashamed or hide what they have done. Also, if the plane were highjacked it would have to land somewhere. This is a huge airplane. It cannot land just anywhere. Even if there was a deserted airport of military base used somewhere for something like this people nearby would have heard the airplane on approach. So, lets get back to the question as to what do I think happened to Malaysia Airlines Flight 370. I have no idea. It is a total mystery to me. If I did know I could probably get a huge reward and buy my own jet. But hopefully I have given those who are following this mystery some facts that helps to understand some of the questions at hand. I apologize if I was not more help. The life of an airline pilot has been describe in many terms. One of the words used is glamorous. I suppose if you look at some of the places that pilots travel to it could be considered glamorous. However, there is another side to this glamour. Lets take for example my first flight flying for an airline. I flew from Phoenix, AZ to Puerto Vallarta Mexico. This is a beautiful area on the west coast of Mexico. It is an area that many people love to vacation. I actually flew into Puerto Vallarta twice within two days. 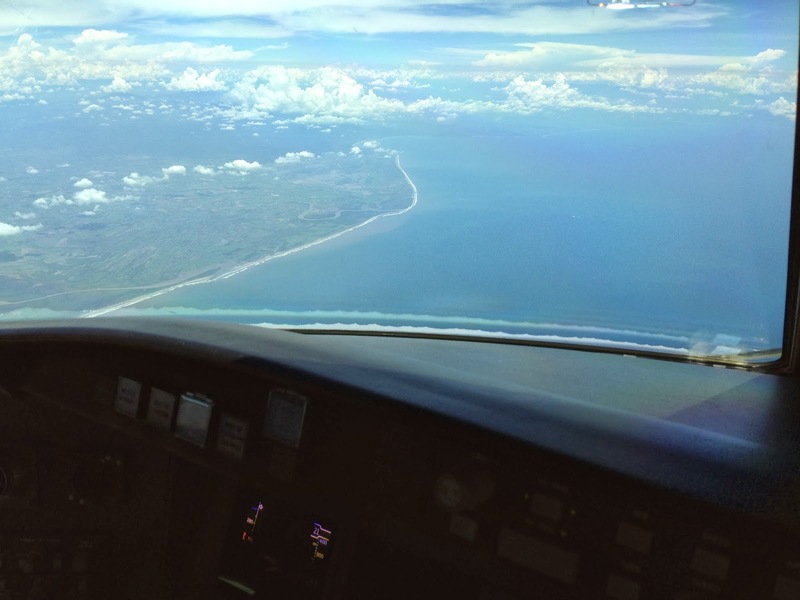 My flight in and out of the area followed the coastline I was able to see the green of the lush countryside blending in with the sand of the beach that so many people enjoyed. There were scattered clouds that added to the serenity of the beauty. I was taking passengers who were going to relax on the beach and enjoy the pleasures of what this vacation spot had to offer them. After landing, we taxied to our gate area. This gate was not attached to a building, but was on the ramp away from the terminal area. A bus came to pick up the passengers and take them to the terminal building. From that point the rest of the crew and I sat in the airplane for the next hour and a half before we started to board passengers for the return trip to Phoenix. Please do not get me wrong. I am not complaining. I love flying a jet. Being an airline pilot is a dream come true. There are not many people who get to do what I do. There are times when I get to relax in a nice area while on overnights with my job. But it is nowhere near as glamorous as what many people think. Another example is where I am as I write these words. I am sitting in a hotel in Little Rock, AR. Also, airlines do not usually get the nice luxurious hotels rooms for crew members. Often times the only thing I want to do when I get to a room is sleep. Actually, there are times that sleep is the only thing there is time to do when getting to a hotel. There is good and bad with what I do for a living. The good is that I get to fly a multi-million dollar jet. In doing so I meet many people. These people are both coworkers and passengers. Flying with a variety of people allows me to make new friends. It also offers me the opportunity to fly with people that I would never want to fly with again. Yes, there are still some of those overbearing type of pilots out there that make a fun job feel like something I do not want to do. The point I am trying to make is that there is good and bad in everything we do in life. There is no such thing as the perfect job. No matter what we do in life there is always going to be something that will challenge us and put roadblocks to our happiness in our way. But it is what a person does with those times that counts. When flying with an overbearing jerk I can give in to his foul attitude and feel worse. Or I can simply just go about my job and not let his attitude affect what I am doing. I could let the long tedious days and short nights get the better of me or I can remember how great it is to get to do what I do. Even when a person is doing what he or she loves, there will be times of disappointment. Finding ways to combat those times of despair is what makes us better people. When I first made the decision to go public with who I am I was scared of the repercussions. I was not sure how this might affect my future. After all, there is still a huge stigma surrounding mental health issues. I thought perhaps I could be crucified in the media. However, CNN did a great job with how it handled the interview when I went public and was dubbed the Prozac Pilot. The topic of pilots and antidepressants is a controversial subject. But my wife and I made the decision together based on the hope that I could help people. The CNN interview was nearly four years ago. I still get emails from around the world. I did not imagine that I would be able to reach out to so many people. I still hope that I can touch the lives of more people in a positive manner. There have also been some disappointments along the way. I have received emails from people who have lost loved ones that have taken their own lives. This is always sad to hear. I talked with a cousin of mine the other day whose 21 year old granddaughter had taken her own life. I could hear the pain in my cousin's voice. She was deeply saddened by the suicide of her granddaughter. She told me that if anyone EVER says they are going to take their own life to take it seriously. Living life to the fullest is the best way to get through life with a genuine smile. Do the things in life that will not hurt others and be the best that you can each and every day. Selfishness does not beget happiness. Joy can only survive when we treat others with respect and decency. This includes how we treat ourselves. How many times do we say, "I love you" to someone. It is a phrase that is said by some several times each day. There are other people who may never say these words, yet there are people in their lives who know of that love because of how they treat them. Love is a verb. Love is not just something we say to someone love is something that we show to others. We show this love by our actions and our words. I received a comment from someone recently regarding my last post. I knew what I wrote could be taken as harsh by some people. I was simply stating feelings. When I come on here and write I put down the words that come to my mind. I try to write things that will hopefully help others if they find themselves in a similar situation. Due to this comment I wanted to go further into my feelings regarding my last post. Love within a family should be unconditional. I did not learn to love unconditionally until the past few years of my life. My wife, Jeanmarie, has been a great example for me as to how to do this. I know I am not an easy person to get along with. In reality, not many people are actually. Everyone has their little quirks that will upset other people. With that said, my wife and I do have disagreements. There are times I will upset her and there are times she upsets me. There have been times during the middle of a disagreement she will look at me, calm down and with all the compassion she can muster during her anger say to me, "Yes I am mad at you, but that does not mean I do not love you. I still love you." To me that is unconditional love. She is the type of person who if she never said those three words I would still know that she cares for me deeply. I would hope that I treat her in a manner that she would always know that I love her even if I never said those words again. However, it is still nice to tell each other of those feelings. It always feels good to have the one closest to you say those words to you. The jest of what I am saying here is that I a now learning how to love unconditionally. Now lets address the topic of abuse. When there is abuse in a household it is normally kept inside the home. What happens in the home stays in the home. Children who suffer from abuse usually do not know that this is not normal. Whether this be physical abuse or emotional abuse these children only know this type of existence. Therefore, they do not know they should reach out for help. The abuser certainly is not going to tell anyone outside the home what they are doing to their children. Often times the abusers are survivors of abuse themselves and feel what they are doing is normal. The point that I am trying to make is that anyone outside the home of an abusive household would have no idea that abuse is going on unless they witnessed it for themselves. I know of a family who everyone thought was very loving and normal where the husband was a strong leader in his church. His wife was highly thought of as well. The couple divorced after the husband finally got tired of his wife beating him. Everyone who knew the family was shocked to hear what this woman had been doing to her husband. You just do not know unless you have lived it. Everyone has their own trials and difficulties in life. These hard times come in a variety of trials. These trials may come in the form of a personal loss such as the death of a loved one or the loss of a job. These trials may come due to the way someone has treated us. These trials will also come due to the consequences of our own actions and choices. We all make good and bad decisions. Often times bad choices may have consequences that can haunt us the rest of our lives. I have made choices and done things that I know have hurt others. When this happens all we can do is try to improve things in our lives, work harder to be better and hope those you have hurt can find it in their hearts to forgive. Forgiveness is not an easy thing. The toughest person to forgive can be yourself. I am a person who is very hard on myself. I will never forget when I asked Jeanmarie's father for her hand in marriage. He knew that I had made some wrong choices in life. However, he agreed to what I asked of him. But before he gave his permission he told me there was a promise he wanted me to make to him. I expected a lecture on how I was supposed to treat his daughter. But what he said totally took me by surprise. He looked at me and said, "You have to promise me that you will forgive yourself." Those were some of the most powerful and loving words that I can remember hearing anyone say to me. There are times that someone we have hurt is unwilling to forgive. When this happens there is not much a person can do except to keep working on being a better person. Put your best foot forward and do what you can to not make the same mistakes. If a person is unwilling to forgive you cannot hold it against that person. Just hope that someday they will find it within their power to let the past go. If and when that happens the healing can begin. As I mentioned in my last post. Life is not easy. It is meant to be worked at. Hopefully, we will learn from our mistakes and do what we can to improve ourselves. I know I still have much to learn. I work each day to become a better person. I am nowhere near being the best that I can be. I simply hope that tomorrow I am better than I am today and that in the process of improving I do not cause pain to others.